I am not good off the first tee. I know this. I get jittery. I struggle to get the club all the way back and have a tendency to hit the first one quick and left. It’s something I’m working on, but haven’t found the fix. I only hope that I can keep the first tee ball in play and I am usually solid from there on. I know another player that has this problem… Tiger Woods. He doubled the first hole at Torrey Pines 3 of the 4 days when he won the 2008 US Open. So while its not a good problem to have, I’m not alone. In our final round, starting the day three back I did not deviate from my tendency. The tee shot was a little quick and left. Which is a better miss on No. 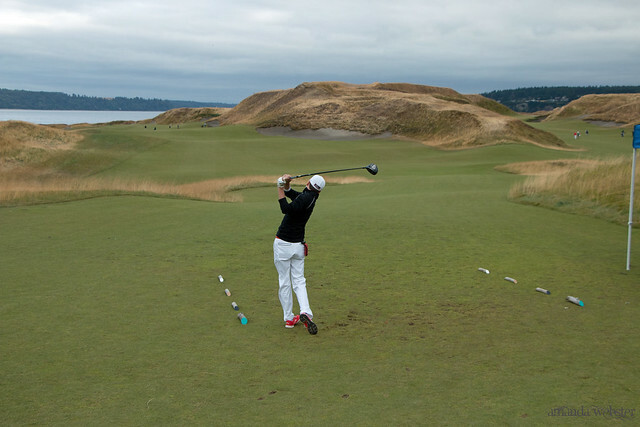 1 at Chambers Bay. Missing right puts you in the dunes, where you’ll be lucky to find it. On the left you just have to worry about hacking it out of the fescue. We were playing No. 1 as a par 5, so it wasn’t a huge deal. I was able to find my ball and actually did well to advance it to about 10 yards short of the front edge. That’s where I made my first real mistake of the day. I had roughly 70 feet to the pin from the fairway. 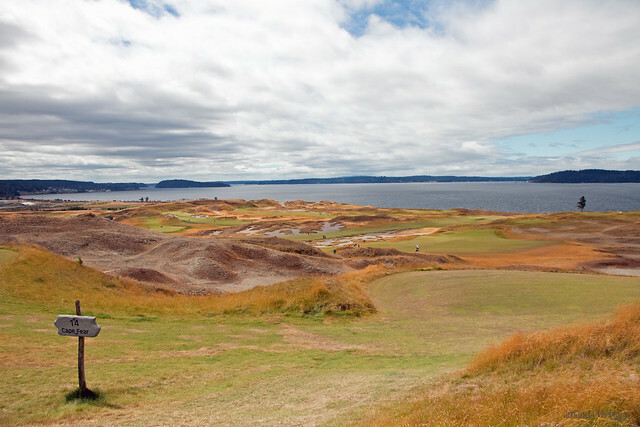 As I described earlier, the fairway and green are almost indistinguishable at Chambers Bay. They are the same type of grass and there is no clear mow line. 9 times out of 10 I would have hit a wedge, however on this day I decided to putt the ball. I was a little nervous, I was afraid I might stick a wedge in the ground on the tight lie and I was lying 2 on a par 5. I figured I couldn’t do worse than 3 putt from here and I would be happy with a par to start the day. This is already flawed thinking, but I also thought I had a better chance to get it close and give myself a good chance at birdie to start the day. What I failed to realize is that I hadn’t practiced any putts near this length warming up. I haven’t putted on the course yet today and didn’t really have a feel for how hard to hit it. I wanted to be aggressive. Didn’t want to ‘lay-up’ the putt. So I reared back and gave it a whack. I immediately knew I’d made a mistake. The ball cruised through the fairway and onto the green, racing a good 30 feet past the pin. A mistake, but no big deal. Two putt for par and get out of here. Not quite. After racing the first one by, I was subconsciously tentative and I left the 30 foot putt a good 10 feet short. That’s right, 10 feet short. I’ve got 10 feet for par. I’m not going to be scared of it. I run it about 2 feet by, but I gave it a chance. Unfortunate. I have 2 feet for bogey. I step over the 2 footer and the demons creep in. That little bit of doubt creeps in and I lip out the 2 footer… Double Bogey. I effectively just 5 putted from just off the green. It felt more like hockey than golf at this point. 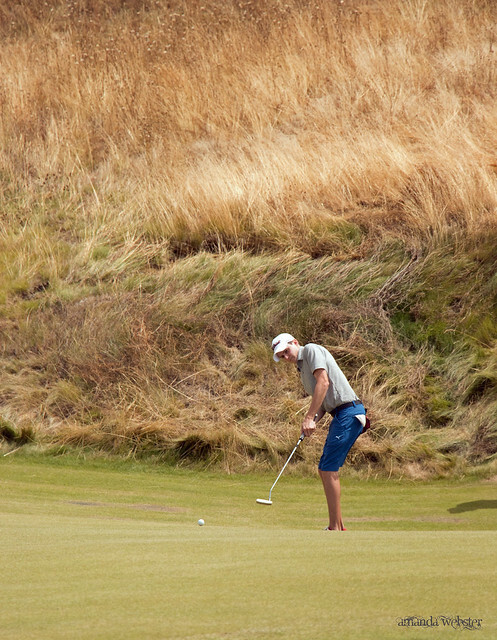 Chambers Bay can do that to you with the undulated greens, but this was self-inflicted. I let nerves rob me of feel and made a mess. The leader makes a good 8 footer for birdie. Just like that I have given the leader 3 more strokes. I am 6 back and just let the field close the gap in a single hole. Not the ideal start. The second hole is a short par 4 that only requires a long iron off the tee. I hit a chunk and run 3 iron down the right hand side that left me a mid-iron into the green. The second green slopes pretty hard right to left and has a large ridge in the middle of it. My caddie and I agreed on a club given the wind and I flushed it. A nice little draw at the right side of the green, but it was too much club. I was on the green, but 45 feet away. On the wrong side of the large ridge. Even with a good first putt, I left myself a difficult 6 feet and ended up with a 3-putt bogey. Not good. I have played 2 holes and used my putter 8 times. Lucky for me, the leader also makes a bogey after failing to get up and down. I’m still 6 back. The third hole is a mid-range par 3. Bunkers left and long. The back bunker is dead. Especially on this day as we have a back pin that is just a few paces from the bunker. I pure another iron off the tee. My swing was feeling really good, despite the rough start putting. Unfortunately, again it is too much club. My ball was tracking on the flag, but flies into the back bunker. The same one that I just said was dead. When I see the ball, I’m not happy. The lie in the sand is okay, but it is on a downslope, with the edge of the bunker extremely close to the back of the ball. I have to stand with one foot out of the bunker and the ball well below my feet. I have double or worse staring me in the face. Somehow I manage to pick up the club quickly and make a perfect swing. The ball hits a foot from the pin with spin and ends up about 3 inches away from going in. It was an incredibly lucky par save, but I’ll take it. The leader also makes par. Still 6 strokes back, but lucky to be there. 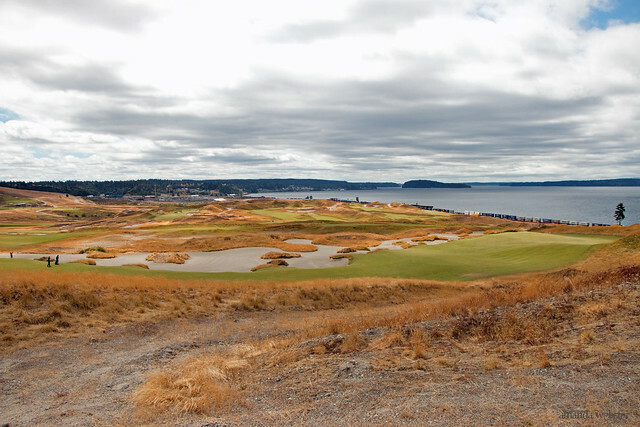 I love the fourth hole at Chambers Bay. It is a unique hole. A par 5 that starts to climb up out of the bowl. The closer you can hug the right hand side, the better chance you have of being able to go for the green in two. The second shot on the hole has to rise up a steep slope to a green surface that you can’t see much of from the fairway below. I hit a perfect drive down the right hand side and had roughly 220 to the green. With the steep slope and the wind, its playing 240 to the hole. The way I am swinging the club, I think I have a chance to get up there. And I need a birdie. I take a 3 wood and pick a conservative line, but one that will get me on the green. I hit it well, but it comes up a yard short of paydirt. Instead it buries itself in the bunker short. Just a nasty buried lie with very little green to work with. I get it out of the bunker, but not to the green. I have a sideways stance on a sideslope in deep rough. I do good to get it on the green, but miss the 8 footer and tap in for bogey. Poor decision making. However, the leader also makes bogey. Still just 6 strokes back. The fifth hole beat me up all three times I played it. It should not be a particularly difficult hole, but the tee shot is down a huge elevation change with huge bunker complexes on both sides of the fairway. Straight back at the Puget Sound. Really pretty hole. The problem is that your tee shot is exposed to the wind for a very long time and therefore needs to be straight. I hit a drive with a little bit of cut in it and the wind pushes it into the fairway bunker on the right. I was there all three days. Forced to lay up, but hit a good shot to just 50 yards or so short of the green. From there I try to get cute and leave it short in the green side bunker, end up making double. After being in a good position to start the day, I am now 6 over through 5 holes. I am throwing away my opportunity around the greens despite hitting the ball well. The leader makes bogey and I leave the hole 7 back. It is starting to look dismal. The sixth hole is a relatively tame, straightforward hole. I hit a good drive and finally got the distance right on an iron to leave myself 7 feet for birdie. I made it. The leader bogeys. Two shot swing and I’m only 5 back. Hole 7 has a challenging tee shot. The hole doglegs hard to the right over a large waste / sand area. It tempts you to bite off as much as you can to get closer to a green that is steeply elevated from the fairway. However, if you don’t bite enough off, your ball will go through the fairway and into the thick rough on the other side. I hammered my drive and it carried the waste area with ease, but bounded into the rough. My second shot to the elevated green went long and I failed to get up and down for bogey. The leader also bogeys. No blood. 5 back. The eight hole is a straightaway par 5. 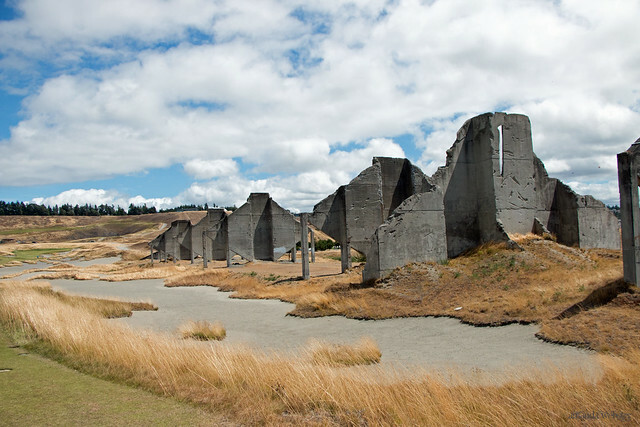 The hole runs along the edge of the quarry, with a severe slope up on the left hand side and a severe slope down on the right hand side. I pulled my tee shot slightly into the rough, but was able to lay up to roughly 50 yards. I hit a low, spinning wedge to 5 feet and made the birdie. The leader pars and I’m only 4 back. Hole 9 will be interesting for the open. It is a par 3 with multiple tee options. The option we played was roughly 200 yards long with a dramatic 100 ft elevation change down to the green. A really pretty hole. It also has the option to be played from a tee that is 90 degrees rotated, hitting up to the green. The difficulty from the tee we played is that the ball is in the air for a very long time and is at the mercy of the wind. It is difficult to judge the wind and distance correctly. I left mine slightly short of the green into some rough. I hit a fantastic pitch to 8 feet, but missed it. Bogey. 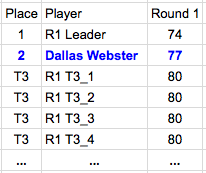 Leader pars. Back to 5 back. Hole 10 is another great hole. 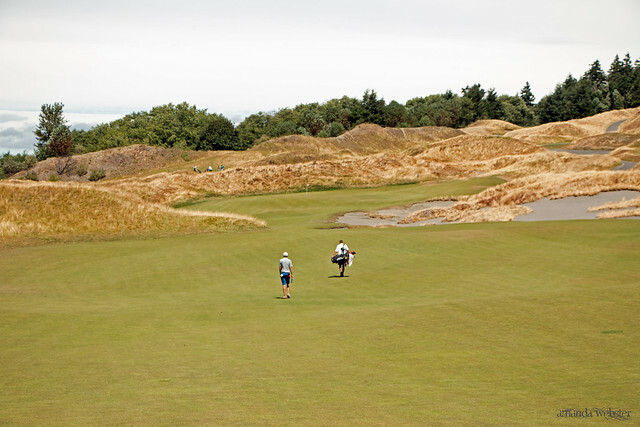 The hole is cut like a valley through some of the sharpest dunes on the course. The fairway gets narrower the further you hit your tee shot. The green is cut in a bowl, but the surroundings are severely pitched and covered in knee high fescue. You don’t want to miss the green. I hit a great drive and great approach. I made the 4 footer for birdie. 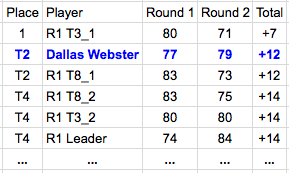 Leader pars. Only 4 back. This is the first point in the round in which I began thinking I had a chance. I had a horrific start. But I’ve played the last 5 holes at -1. I’ve made 3 birdies in the last 5 holes. The leader is obviously struggling as well. I feel like he is noticing my birdies and getting a little shaky. Time to put the pressure on. Hole 11 is a sort of a double dogleg shape, but it plays straight away. 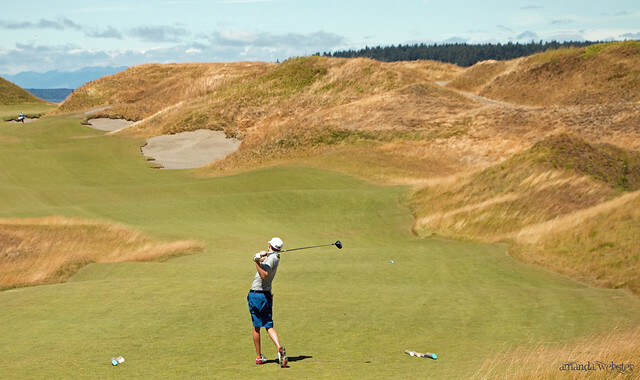 You just have to commit to a tee shot that you can’t see land over a large dune in the middle of the fairway. I bust a drive 20 yards past my competitors and hit a good iron, but the birdie putt from 12 feet lips out on me. Pars. No blood. 4 back. The twelfth is a drivable par 4. Otherwise you can lay up to a very narrow fairway. The green is in a valley and is partially hidden by a built up bunker on the front edge. The hole was playing 280, but downwind. I still had the honor from the birdie on 10 and I crank a 3 wood that gets onto the front edge. I’ll have roughly 60 feet for eagle. This rattled the leader. He decides to play it safe to protect his 4 stroke lead at this point. He pulls an iron and decides to lay up, but he shanks the tee shot! Uncharacteristic of him. He is a great player, but he has just hit his tee shot ~100 yards into the tall fescue. From there, he does well to make good contact, but airmails the green and goes out of bounds. His next shot finds the green laying 4. This is the hardest green to putt. As my caddie mentioned, it looks as if two elephants are buried in the middle of this large green. I hit a poor lag putt and still have 15 feet for birdie. I two putt from there for par. The leader has a 3 footer for 6 that lips out on him. Nerves. A 3 shot swing. I’m only 1 back. Hole 13 is a tough dogleg right par 4. Hitting it further right dramatically shortens the hole, but makes for a blind landing. I make a solid par after driver / 3iron. The leader bounces back to make par. Still 1 back. The fourteenth is a really cool driving hole. Big dogleg left with a large carry over sand. Basically the opposite of the 7th. I smoke a drive into the fairway, but my iron comes up long. A failed up and down and I make bogey. So does the leader. 1 back. The fifteenth is a par 3 that can play really short, or really long. It will be interesting to see what the USGA does with it. It plays downhill and back towards the Puget Sound. The ball is in the air for a long time on this hole and so you are exposed to the wind. My ball misses the green right. I hit a good chip, but can’t convert. Bogey. The leader struggles with his up and down as well. Remain just 1 back. I’m running out of holes, but I’ve done well to give myself a chance. I’ve completely turned around my day from how I started. And I’m starting to feel more confident with my game. Hole 16 runs parallel to the ocean. It’s an intimidating tee shot with sand / dunes all up the right and high rough / fescue on the left. The wind is ripping off the ocean, which makes it difficult to hit it far enough to the right. My tee shot finds the rough on the left. I hit my approach short and left and make a solid up and down for par. The leader lips out for par. I’ve caught him! We’re even. I can’t help but smile. He is struggling. The seventeenth is a slightly downhill par 3 with a green that is divided in two. The pin was on the top shelf on the right hand side. There isn’t much room over there. I take dead aim and hit it to 8 feet on the correct level. The leader knocks his to 30 feet, but on the lower level. He lags it to about 4 feet. I lip out the birdie putt and tap in for an easy par. The leader misses the 4 footer. Holy cow! I’ve caught him. All even. He is falling apart. I’ve got one more hole. Let’s finish the round. Eighteen is a slightly uphill par 5. There are dunes and sand everywhere and the green is significantly elevated from the fairway. The fairway is extremely tight in the landing area as a bunker cuts through the middle of it. I smoke a drive that takes a bad bounce to get in the fairway bunker. The layup from the bunker is not easy, as there is a weird pot bunker that is probably 15 feet deep at about 120 yards from the green. You must avoid this at all costs. I manage to lay up in the fairway, but have a stout 5 iron into the green. I flush it, but it doesn’t get all the way back to the back pin position. I have 40 feet up to a separate tier. I don’t read the putt particularly well and leave myself an 8 foot putt for par. The leader has roughly 5 feet for his par. This was a critical moment for me. I have no idea what the guys in front of me have shot. I do not know where I stand anywhere but in this group. All I know is that if I miss this putt I give him an opportunity to tie me. It is the definition of a must make for me. I can feel the nerves. 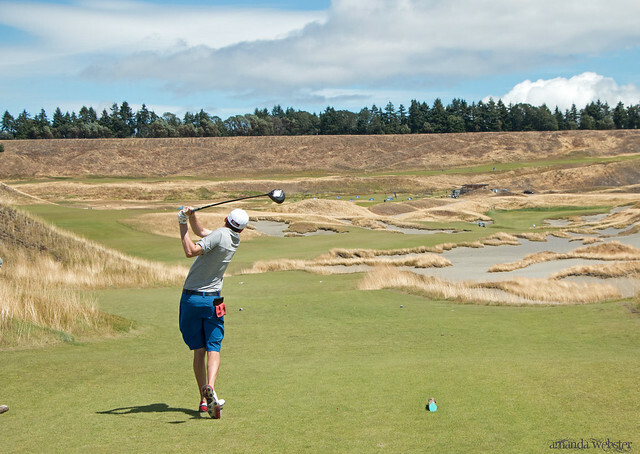 Even PGA pros are only 50% from this distance. My heart is pounding. No time to be tentative. I take a deep breath, commit to my line, and drain the 8 footer. Right in the center. Never a doubt. I can almost feel the air come out of the leader. He has been keeping score. He knows that there is no way he can win. His half hearted attempt at the 5 footer misses. I beat him by 2. Disappointed, he shakes my hand and his caddie congratulates me on the win… but I had to correct him. I don’t think I’ve won. I started the day 3 strokes back of the leader, but there were 4 guys that were only 3 strokes behind me. And while I am proud that I fought back from being 6 over through 5 holes to only shoot 79, I am confident that someone has caught me. From a scoring perspective, it was the perfect day to go low. Relatively little wind and other than being cool, the conditions were perfect. We have to take a shuttle to the pro shop as it is at the top of the hill. Unfortunately I was right. Someone did catch and pass me. There was a 71 out there. It was shot by a local that has played the course many times. He had also won the event earlier in the year at the course. So he certainly had that advantage. I’m not disappointed. I controlled what I could control. The only thing I could do after my horrible start was to focus on improving and I did that. I think the late bogeys on 14 and 15 were partially caused by looking too much at what the leader was doing. He was allowing me to make bogeys and not lose ground, and so I did. But I can’t ignore the fact that I played the last 13 holes at +1. It was a great recovery. I made clutch shots starting on the 6th hole and really put pressure on the leader. If I could have done the first 5 holes over, I believe I would have won. I definitely learned something from the round. I was proud of the way I fought. I had been in that position before (the previous year at Horseshoe Bay) and folded when things started to go sideways. Golf is a game where you have to worry about yourself. You can’t get distracted by what others are doing. I believe my early struggles affected the leader. He started the day with a 3 stroke lead on me and 6 strokes on the next guy. He played like he had a cushion and slowly bled bogeys. When he saw me struggling he was focused on beating me, never realizing that the bogeys were piling up and there were others in the mix. This led to more and more mistakes until it slipped away completely. It is hard not to focus on score, but it surely doesn’t help your golf. I was counting every stroke that day to challenge myself to beat the leader and I think it even cost me a couple. It distracted from the focus I needed to have on my golf game. Something to work on. 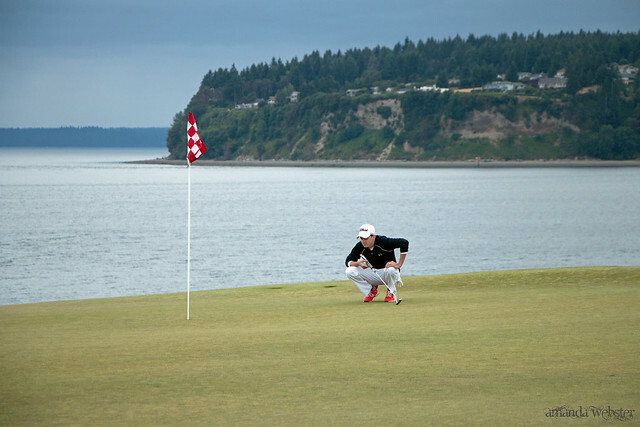 In any case, Chambers Bay is beautiful. I think it has tremendous character. 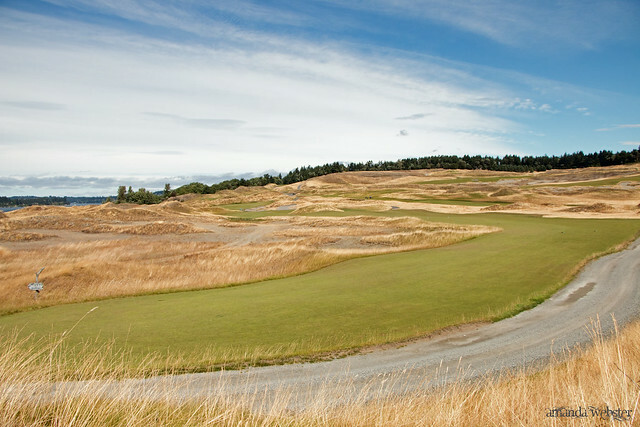 Despite the early criticism, I think this is going to be a great US Open and the course will provide a great champion. I can’t wait to see how the pros fare on the course and I can’t wait to go back. Special thanks to my lovely wife who took all the amazing pictures. Its a gorgeous course and she did it justice.